UK July industrial output increased by 0.5% after rising by 0.3% in June, driven mainly by a 3.6% jump in gas and electricity output, according to figures published by the Office for National Statistics. Most economists had expected a 0.2% increase for July. However, the country’s trade deficit also grew. Year-on-year, industrial output was up by 1.7% in July, which reflected a 2.2% increase in manufacturing and a 3.4% rise in air conditioning, steam, gas and electricity output. Manufacturing in July grew by 0.3%, which was about the same as forecasts. Over a three-month period ending in July, however, industrial production declined by 0.1% compared to the same period a year earlier – the first fall in one-and-a-half years. 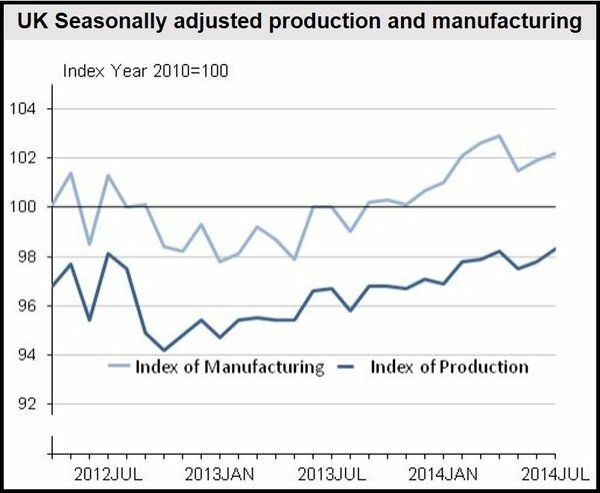 In the quarter ending in July 2014, production and manufacturing were 11.3% and 7.6% respectively below the first quarter of 2008, a peak reached just before the global crisis hit. Manufacturing is losing some of its steam as the Ukraine crisis kills off demand in the Eurozone, the country’s largest trading partner. GDP growth in the European currency bloc flatlined in the second quarter. According to the Office for National Statistics, UK’s trade deficit in goods jumped to ₤10.186 billion, compared to forecasts of about ₤9.1 billion. July’s deficit was the highest in 2.5 years. The deficit was driven by a steep increase of aircraft imports. From June 2014 to July 2014, exports rose by ₤0.5 billion to ₤24 billion, while imports increased ₤1.3 billion to ₤34 billion. Trade with non-EU nations accounted for the bulk of the increase in imports and exports in July. Germany posted record exports as well as a record trade surplus in July.